Autumn is a Dutch female fronted band with Gothic influences that has existed in one form or another since 1995. The line-up has remained unchanged since the arrival of singer Marjan Welman who replaced Nienke de Jong in 2008. 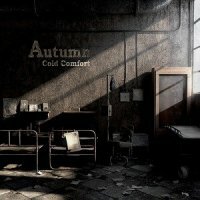 'Cold Comfort' is the fifth full length release and the third for the Metal Blade record label. I actually came across Autumn myself due to the track 'Satellites' several years ago. It was included on one of Nuclear Blast's 'Beautiful Voices' compilations and was from the 'My New Time' album that featured the previous singer. On purchasing 'My New Time' I was left rather underwhelmed by it's quality and even now can't bring any songs to mind aside from 'Satellites'. After living with 'Cold Comfort' constantly for the best part of a week I have mixed feelings that draw heavily on reservations attached to my previous flirtation with the band. There seems to have been little in the way of development during the last few years and the songs lack any real impact, even as I listen again now whilst typing my review. Throughout the nine tracks there is no real variation in pace and a repetitive attitude seems to prevail. Marjan's vocals are pleasant enough, though not memorable, and she never pushes herself enough to give the songs any identity or dynamic. The band contains two guitarists but the mix never allows for their power to resonate. Not once do they cut loose with a blistering solo to enliven proceedings. The Gothic influences are kept to a minimum and some of the musical passages actually have a progressive edge. These elements are only hinted at though and never really dominate.....this is the slight difference I can detect since 'My New Time'. Regardless of all these negativities there is just something about 'Cold Comfort' that I still like. This may be a result of repeated plays or the possibility the songs do have a quality that makes them creep into the subconcious without knowing. Not an instant fix for sure but fans of The Reasoning or Karnataka may find plenty to enjoy here. In summary I'm afraid this CD will always be just background music for me and Autumn still have a long way to go before they step out of the Within Temptation shadow (though I have definitely heard a lot worse during the last few months).